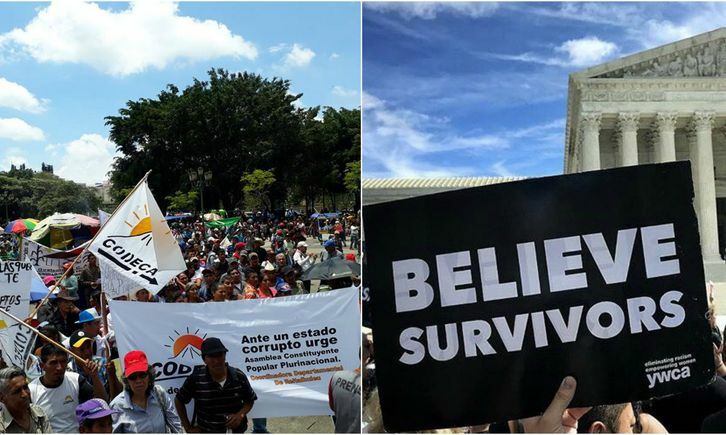 Illiberal protesters in Washington, DC, and Guatemala City share a common vision and strategy: all power to the state—under their control—and the ends justify the means. The Kavanaugh Supreme Court confirmation process revealed the divide between supporters and opponents of liberty. The opponents want to discard individual rights for their political agenda, which is a path to tyranny. The “We believe survivors” placards illustrated an anti-democratic, anti-rule-of-law nature. All accusers and accused deserve due process on an individual, case-by-case basis. This is not limited to courts of law but must be a societal value for liberty and prosperity to prevail. An example of where politics over principles can lead, driven by the socialist mob, is on display in a key country for the flow of illegal gangs, drugs, and migrants to the United States. Congressional Democrats and State Department functionaries are covering for serious crimes and promoting totalitarian behavior in Guatemala in pursuit of their political agenda. The tip of the iceberg is the UN Anti-Impunity Commission (CICIG), a tool for globalists to take power in Guatemala. The commission was created to help identify and dismantle clandestine security apparatuses, but it has become what it was sent to combat. Guatemala’s mass media suppress negative information about the CICIG, but locals on social media and civil-society organizations have exposed blatant CICIG criminality. Working with a judiciary coopted by State Department intervention under former President Barack Obama and US Ambassador Todd Robinson, the CICIG has illegally imprisoned many people, coerced false testimony from witnesses, and evaded criminal responsibility through diplomatic immunity. In August 2017, President Jimmy Morales denounced to UN Secretary General António Guterres CICIG violations of law and the Guatemala-UN agreement that created it. The United Nations did nothing. In August this year, Morales announced he would not renew the CICIG when its mandate expires next September. Later, he denied reentry to the country to CICIG Commissioner Iván Velásquez. With his General Assembly address last month, he forcefully denounced CICIG criminality and the lack of a UN response. Morales has insisted Guterres name a new commissioner. However, the secretary general wants to name a deputy commissioner—a non-existent position—while Velásquez continues to run the CICIG from outside the country. Guterres, Velásquez, and their backers, including George Soros, know that any new commissioner might balk at becoming an accomplice to CICIG criminality. The agreement would require him to expose what the CICIG has done. Not only would globalist hopes of conquering Guatemala end, the widespread exposure of the CICIG crimes would undermine its advocates, especially State Department functionaries. The globalist agenda of imposing such commissions on other target countries would also end. Globalists must suppress this information, as with the investigations into high-level Obama administration actions regarding the 2016 election, including framing candidate Donald Trump. This is right out of a George Orwell novel. Robinson coerced the Guatemalan Congress to name a guerrilla sympathizer to the country’s highest court. Using US power, Gloria Porras intimidates other magistrates to vote with her and protect from prosecution guerrilla successor groups that dominate rural areas, especially the borders. The protection includes persecuting legitimate authorities doing their jobs. The interdependence of the CICIG and the Constitutional Court, with support from the State Department, guarantees the flow of illegal gang members, drugs, and migrants from and through Guatemala to the United States. Even without Velásquez, the CICIG and the nation’s highest court will try to steal the 2019 elections, and their victory would continue the illegal flow. CICIG advocates have used the letter to Pompeo and the Torres visit as proof to Guatemalans that the Obama policy reigns under the Trump administration. Guatemalans struggle to understand that Democrats don’t speak for Trump. At a recent rally, talking about the Kavanaugh process, Trump called Democrats evil. Guatemalans need to know that Trump doesn’t support Torres, Leahy, nor their Democratic colleagues—and they certainly do not represent his administration. Torres was not in Guatemala to find facts, nor for oversight. She took a proactive role in US foreign policy together with the State Department to promote the globalist agenda against Morales and the Trump administration. Trump, Pompeo, and Ambassador Nikki Haley have recently supported Morales. They should correct the mixed message sent by Democrats and State Department globalists. Trump said recently at a rally in Kansas, “Today’s Democrats have embraced radical socialism and open borders.” Guatemala is proof. Trump can significantly reduce the power of gangs and the flow of illegal migrants and drugs to the United States. He need only make clear that if Morales agrees to act, US support will include equipment, training, and on-site advisors to assist in taking out criminal gangs, especially in the border areas. Trump should also support Morales in dealing with the rogue Constitutional Court, the CICIG, and the State Department, which together protect the gangs. Democrats and their allies in the permanent bureaucracy, a.k.a the deep state, have shown in Guatemala their unprincipled willingness to do anything, as they have at home in a less obvious manner. Americans should not doubt that if they don’t recognize and defeat this domestic threat to liberty and the US Constitution, it will grow more brazen and stronger.